It is always a joy to return to my country – Gascony—for any length of time. This summer, I spent 3 weeks there with my family and friends. We rented a rambling old farm house with a swimming pool and we relaxed into the pace of South West France. Which can actually be pretty brisk! Summer is dedicated to food and music festivals in Gascony, so there was plenty to do. There is the Tempo Latino festival in Vic-Fezensac and the Jazz Festival in Marciac, where Wynton Marsalis always appears. We went to Cuivr’enfoliz, a brass band music festival in Fleurance, which featured 12 brass bands, including some all-girl bands. Not far from there is the lovely town of Barran, a bastide, or medieval fortified village. If you are lucky enough to visit Barran, you can’t miss the famous church, the 13th century Collégiale Saint Jean-Baptiste. Its spire is helical, or spiraled. In the middle ages, artisans learned their trade by apprenticing with masters and then proved their skill by producing a masterpiece of their own. This church is one of those masterpieces—and a real challenge of symmetry. Anyone who knows me knows that I adore Armagnac. Maybe it’s a bit chauvinistic, but I truly love the fiery intensity. And, no, Cognac is not the same –I won’t drink it! And in a region known for Armagnac, the ancient city of Éauze is the capital of Armagnac. So, after a day of visiting my good friends Armagnac makers at Domaine de Lagajan, then saying Hello to the Grassa family at Tariquet, we gathered for dinner at a long table under the ivy awning for a well needed solid ration. After the late dinner, we sat at “the loft,” in the middle of the main square to sip more Armagnacs. Their outside cart alone stocks 53 varieties. A “normal” tasting is about 6, but we had to try 14 types, could not decide which ones were better than the others, and have no idea how we got home. At Domaine Lagajan, under the direction of George, the father, the whole family makes Armagnac the old way, with a continuous still over a wood fire that must be tended for the entire week that it takes to distill pure spirits. The fire under the beautiful copper alambic is a convenient place for the workers to make their lunch while they babysit. A hallmark of Armagnac production is la part de anges, or the angel’s share, which is the percentage of alcohol that evaporates from the casks, every year. These vapors create a black fungus (Baudoinia compniacensis ) that you’ll see thriving on the alcohol fumes on the walls of the distillery and aging rooms. One can see it on the outside of the building, which is a telltale sign that some Armagnac casks are aging inside. George accumulated, over the years, a huge collection dedicated to the old ways—farm equipment from the Middle Ages and other instruments we have forgotten how to use. I liked the painting of D’Artagnan at the entrance, hanging above a few swords and a plumed hat. At Vic-Fezensac, where Tempo Latino is held, we encountered a flock of geese outside the tourism office. We thought they were looking for Youri Buenaventura, who was performing that evening, until we saw the gooseherd with his dog. On their way to the foie gras market, maybe? Farming is an important part of life in Gascony, but raising bulls for bullfights is pretty unique. Jean-Louis Darré, a man whose entire life and passion is about breeding these fierce animals, invited us to look at them up close, in his ranch near Mirande. The bulls were magnificent to see… from a distance. We couldn’t get too close. Though, apparently when they are in a group, the bulls remain calm, we took no chances. We also became friendly with a neighbor near the vacation home in Marambat who raises bees. 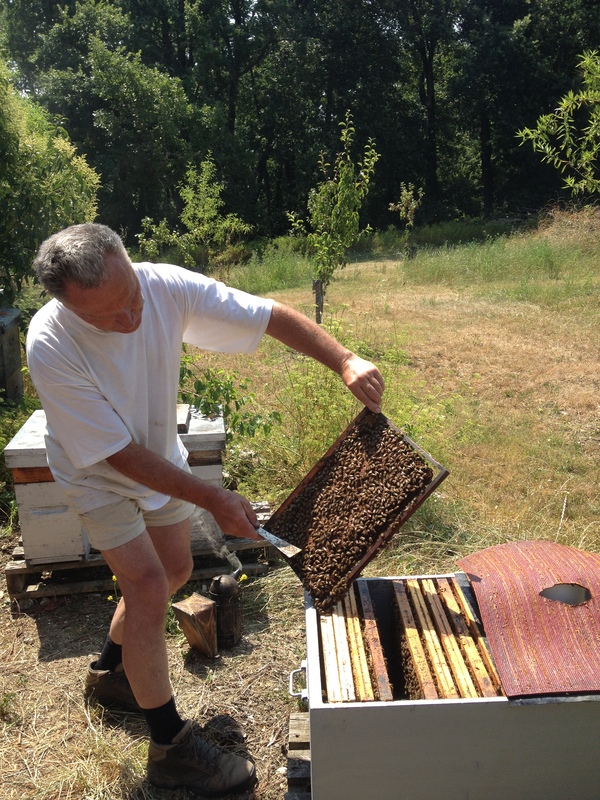 He has 12 hives and how he removes the honey is amazing! It is a little bit stressing but totally amazing to be surrounded by bees with their gentle buzzing, and the smell of the summer fields and fresh country air. He tends to his 3 organic potagers, (kitchen gardens), one of which is regularly stomped by a family of wild boar, and about 2 dozen hens. Like most people in Gascony, surviving and even striving on his own food production is just a way of life. Ah, the food. It’s all fresh, locally grown on family farms, and every time you eat, you are experiencing the honest flavors of the land. The only time you rely on “foreign” ingredients, is to take inspiration from neighboring Spain, like the day we made a huge paella outdoors, with incredible seafood: langoustines and mussels, and chicken, rice and plenty of chicken stock. For outdoor grilling, we used the bottom of an old wine press and made pork ribs the country way. The marinade was piment d’Espelette, olive oil, wild oregano we picked ourselves on the roadside and fresh thyme and rosemary from the garden. No BBQ sauce needed! When I go home I am reminded of the importance of food raised the right way. Growing up in a place dedicated to food – from the hotel kitchen of my father to the surrounding farms and vineyards—taught me so much. Here in my adopted home, I try to bring that sensibility about food to my American friends. Spending time in Gascony reminds me of this mission and inspires me. It is a region of France less traveled than others, and it is raw and beautiful, full of character and wonder. If you can, go to Gascony. You will see a side of France you might not expect, and you will eat well, I promise.